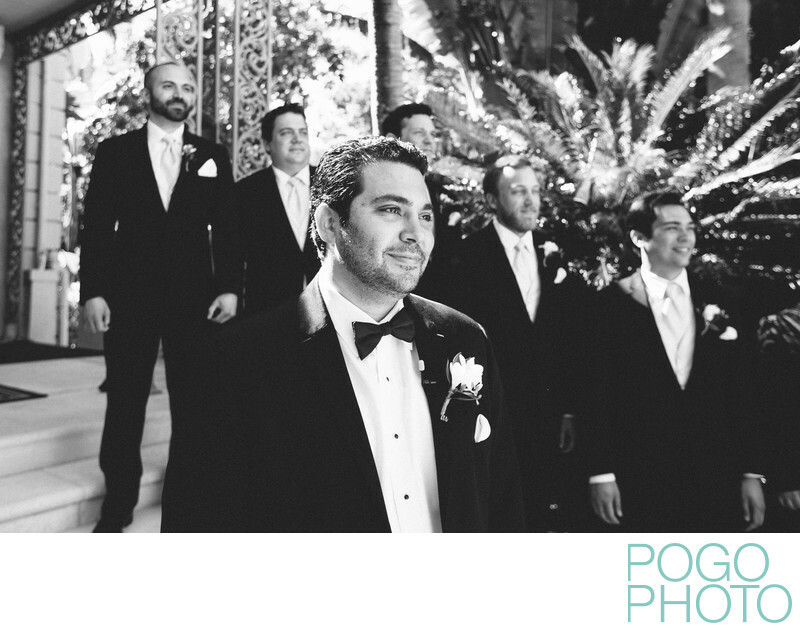 This groom seeing his bride walk down the aisle has the sweetest expression of love and devotion on his face, with a sparkle of tears lighting up his eyes as she is revealed across the garden. We've had clients ask if scheduling a first look takes away from the experience of the aisle reveal; the answer is a resounding "no!". In fact quite the opposite is true; a first look releases the pressure on the day's timeline, certainly, but it also gives the wedding couple a chance to speak privately, to share the earlier part of the day together, and to unite as a team headed toward a pivotal moment in their relationship. The history behind not seeing each other before the ceremony stems from some not very romantic traditions: in an arranged marriage the parents didn't want the groom to get it into his head to run away from a bride who was less attractive than he'd hoped, and so the "bad luck" was associated with couples who had never before met. The average modern couple has already been living together for some time, and arranged marriages are incredibly rare in western society, which makes the aisle reveal an antiquated and old fashioned part of the wedding day that is best skipped for many reasons. Having a first look on your wedding day can give a busy timeline some breathing space and also give the two of you a feeling of intimacy that's missing at all but the smallest elopements. We can't recommend this strongly enough; seeing your bride or groom before the ceremony can be a strongly emotional experience, one that's best explored with some privacy rather than on display in front of your many guests and family members, where you don't have the ability to stop and cry and chat with your partner and best friend. 1/400; f/4.0; ISO 400; 28.0 mm.